Yoga may help ease your aching neck and shoulders. Almost everyone suffers from neck and shoulder pain at some point. Many people spend most of the day sitting hunched over their computers, which can lead to chronic neck and shoulder pain. Injuries, arthritis and common postural problems like slumped shoulders and a forward neck can also cause or exacerbate shoulder and neck pain. Yoga can help stretch your neck and shoulders and alleviate some of your symptoms in a natural, noninvasive way. Consult your doctor if your pain persists or is accompanied by additional symptoms. Roll a blanket to a height of around 6 inches. Sit on the floor with your legs stretched out straight and your arms by your sides. Place the blanket behind you, vertical to your spine, and slowly lower your body down to the floor, so your head, neck and spine are supported by the blanket. Open your arms out to the sides, allowing your chest to open and your shoulders to fall to the floor. Ground your legs into the floor and pull your toes up toward your body. Stay here for five slow, deep breaths. Sit on the edge of a chair with your knees and feet hip-width apart. Rest your hands on your thighs, palms facing down. Relax your shoulders and expand your chest. Imagine that someone is pulling on a string on the crown of your head, lengthening your spine and drawing your head toward the ceiling. Breathe in this position for a few moments. 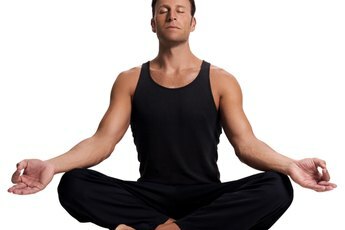 Then inhale deeply, and on your next exhalation, drop your right ear to your right shoulder. Reach around with your right hand to gently press your head closer the shoulder. Stay here for a few breaths, then inhale and return your head to center. Repeat on your left side. Stand with your feet hip-width apart. Center your hips over your feet and align your head, neck and spine. Keeping your legs as straight as possible, bend forward from your hips. Allow your body to hang loosely for a few moments, then clasp your hands behind your back. Lift your elbows and raise your clasped hands toward the ceiling, keeping your arms straight. 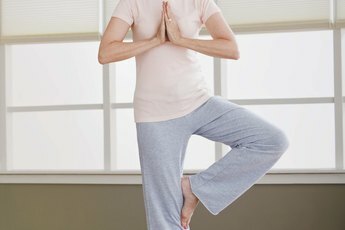 Hold this pose for 30 seconds, then release your hands and return to a standing position. Place a rolled blanket on the floor. Lie on your back with your knees bent and your neck supported by the blanket. The blanket should be rolled tightly enough so it just fits between the base of your head and the tops of your shoulder blades. Bend your arms and place the palms of your hands on your forehead with the fingers pointing away from you. Bring your elbows together. Close your eyes. Breathe in to areas of tension in your neck and shoulders, and mentally encourage those areas to relax. Gently ease your shoulders farther down off the rolled blanket as your neck and shoulders start to relax. 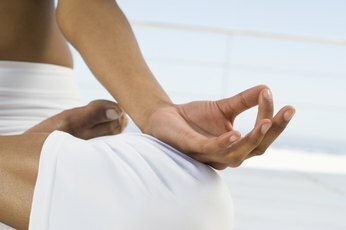 Stay here for several minutes, focusing on inhaling into areas of tightness and relaxing those areas on each exhalation.